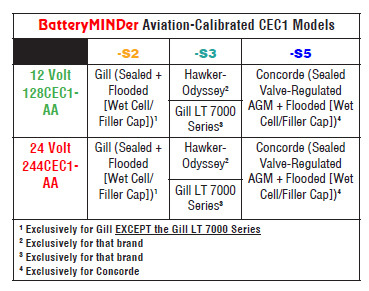 Our new CONCORDE® aviation battery specific 2016 line of BatteryMINDer® battery chargers-maintainers-desulfators are the most advanced we have ever produced. In addition to charging and maintaining sealed or wet cell (filler caps) CONCORDE® aviation batteries users can now determine the level of charge remaining in their battery, and if weak and in need of replacement, before going bad. Units test for weak/dead cells and will recover weak or severely discharged batteries that other chargers would reject. Known as the CEC1-AA series they feature advancements in easy to understand battery analysis and condition not previously available in any other single model. Their high efficiency design, controlled by industrially-rated microprocessors, allow continuous operation (24 hrs/day) for less than $0.43/month* Temperature sensors prevents over/under charging from freezing to 130-F. These chargers-maintainers-desulfators are designed for all size and type 24-Volt CONCORDE® Aviation Batteries. If you want the longest possible life and performance from your batteries there is no other product better at doing just this and BatteryMINDer® Guarantees it! Only been in use for one week but it seems to be doing it's job. I used an early version of Battery Minder for 10 years and it extended the life of my Concord sealed batteries to over 5 years each. The latest version is outstanding, indicating the state of charge and the condition of the cells. I attach the Battery Minder after every flight and have never had a battery problem. BatteryMINDer - Maximizes Concord battery performance and life! I have used a Model 244CEC1-AA-S5: 24V 4 AMP minder for more than 6 years and this device definitely maintains and extends the life of a Concorde RG battery. I keep this on the battery at all times that we are not flying and this has keep the battery at top performance. We have only had them on batteries for 3 days and they are still desulfating. Click the button below to add the BatteryMINDer® Model 244CEC1-AA-S5: 24V 4 AMP CONCORDE® Aviation Battery Charger-Maintainer-Desulfator to your wish list.